I have always been impatient by nature. Each week when I was a kid, I walked over the five and dime store with my allowance while my mom was grocery shopping. 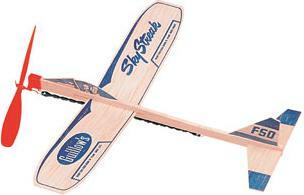 I would by some little toy like a balsa wood airplane, model car or bag of marbles. It frustrated my mother that I could never wait to get home to open my new toy. I always wanted to open it in the car on the way home. I think that in some ways my impatience makes me a better advocate because I am never satisfied with the status quo, but it is not something I am proud of. I am careful not to let my natural impatience alienate others when I am advocating for more bicycle friendly facilities. Sometimes it helps me to take a couple of steps back from whatever particular issue I am working and try to look at the big picture of where we are at and what we have already accomplished. I’m still a new employee at the Bicycle Federation of Wisconsin, so I don’t have my finger on the pulse of all the great things going on around the state. But if I look around my own little corner in Milwaukee, I must admit that we are making progress at a decent clip. In the last 12 months alone, Milwaukee has seen some pretty major infrastructure improvements for people riding bicycles. In order to reaffirm my confidence that we are becoming more bicycle friendly, on Sunday I went for a ride with my friend Jason to look at the Milwaukee area bike projects that have been completed in the last year. First I rode over the Menomonee Valley Passage and the extension of the Hank Aaron State Trail. These projects officially opened just before winter last November, so 2011 is really their first full inaugural bicycle season. I commute to the office on the Hank Aaron most mornings, and I have definitely noticed an uptick in people using the trail since the opening of the extension and bridge over the river. In the ten minutes I spent taking photos of the trail, I saw dog walkers, bicyclists and Brewers fans. 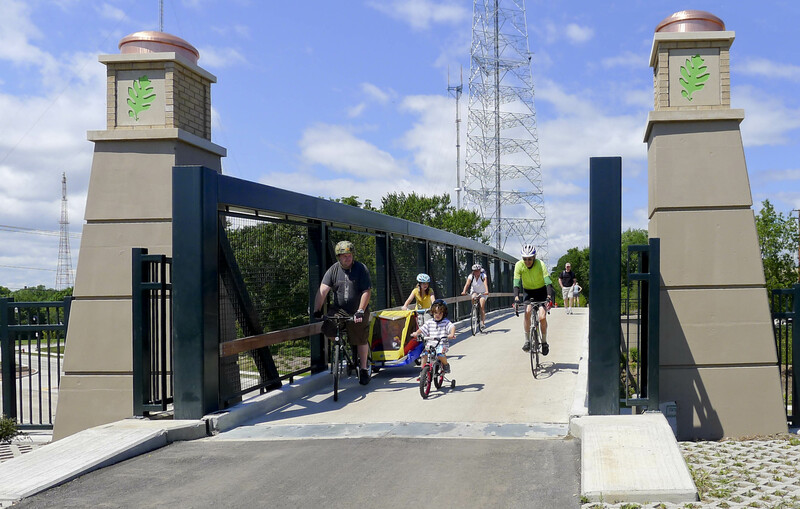 The recently paved extension of the Hank Aaron State Trail and the Valley Passage give tens of thousands of people a direct off-street bicycle connection to Miller park, downtown Milwaukee and the Menomonee Valley. The new valley passage is wider and shorter than the old long, dark scary tunnel. The new ramp is curved and sloped to be compliant with the Americans with Disabilities Act. While taking photos, I ran into some friends who had pedaled in from the west the extension, but they were continuing on down the trail through the valley. I took an alternate route and used the new ramp at the Valley Passage too pop out onto Pierce Street and 37th Streets and headed east down quiet Pierce Street though the Silver City neighborhood and the near south side. 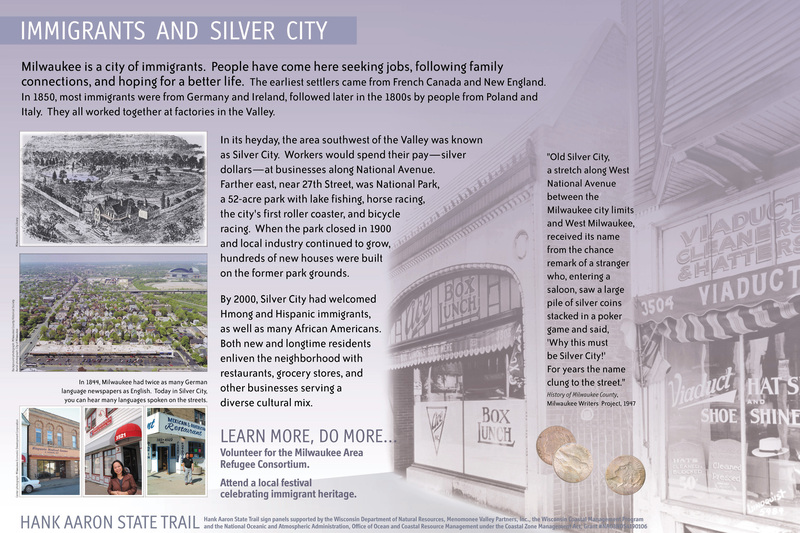 Silver City was so named because back in the days when there were thousands railroad employees working in the Valley’ Milwaukee Road Shops, the Shops paid its workers in silver dollars. On pay-day the workers would walk up through the old Valley Passage and spend their silver dollars in all the saloons along National Avenue. I took Pierce east from the Silver City neighborhood to the Walkers Point area where I jumped onto S 2nd Street. During the recently completed reconstruction project, 2nd Street underwent a road diet to go from four motor vehicle travel lanes to two with bike lanes and wider pedestrian walkways. Smooth new pavement and freshly painted bike lanes have drawn many people on bikes off S 1st, one block to the east, even though it is a more direct route between Bay View and downtown. From there I followed the Oak Leaf Trail signs directing me to the busy east side paths along the lakefront. I passed hundreds of people out enjoying the Oak Leaf Trail on my way to my next stop, the recently competed bicycle and pedestrian bridge for the Oak Leaf Trail over Capitol Drive. I even passed some people I knew. The new bridge replaces a converted former RR bridge. It was necessary when they widened Capitol Drive during the recent reconstruction project. 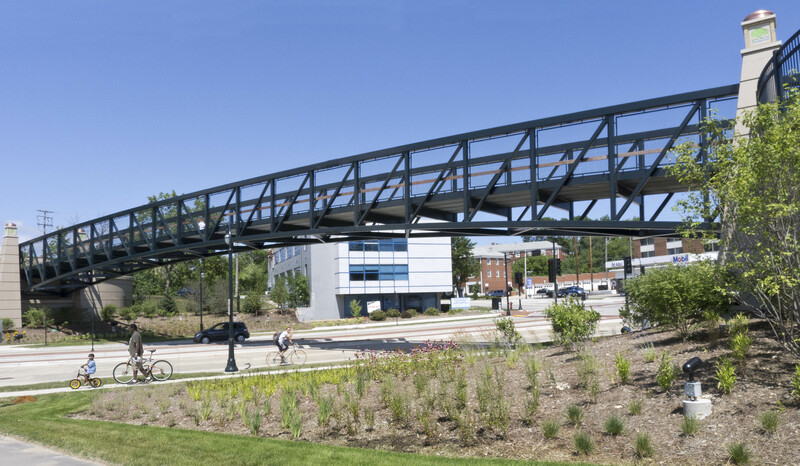 A family friendly bicycle bridge if there ever was one. From the east I headed west on North Avenue, which was reconstructed not to long ago, and bike lanes were added with the project. The city of Milwaukee does not have a formal complete streets policy yet, but they do have individual policies of adding bike lanes and improving pedestrian walkways wherever possible with every road project. 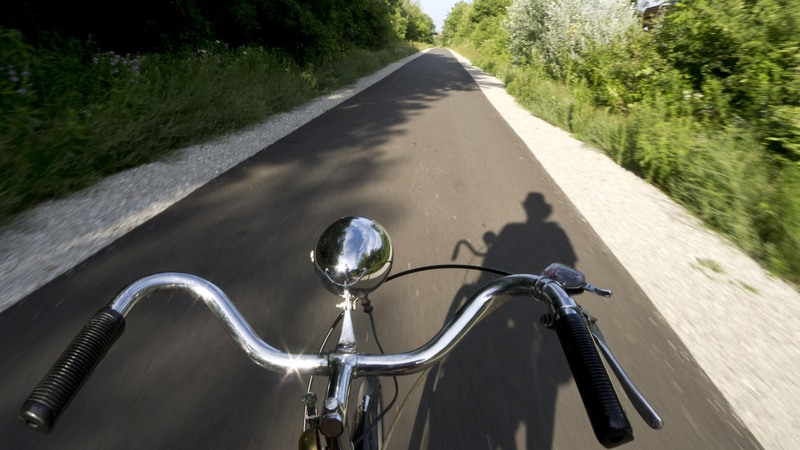 The City has also been retrofitting bike lanes using federal grants. They have enough money to add bike lanes to every major street in the City where they fit without removing parking lanes or moving curbs. With about 53 miles of bike lanes now, Milwaukee should have well over 100 miles of bike lanes when that project is completed next year. I certainly enjoyed the smooth new concrete and well-marked bike lanes on my trip west yesterday. I wasn't quick enough with my camera to catch the young teen-aged child riding ahead of this woman. Milwaukee has proven that if you build bike facilities, more people will ride, even in areas that were previously not bicycle friendly. The last stop on my tour of new bike projects was the new underpass constructed at Bluemound Road and the Underwood Creek on the far west side of Milwaukee County. This project was done as part of the Bluemound Road reconstruction. It is a small part of the much larger project, but these little improvements make all the difference in the world when it comes to tempting more people to ride a bike instead of drive. 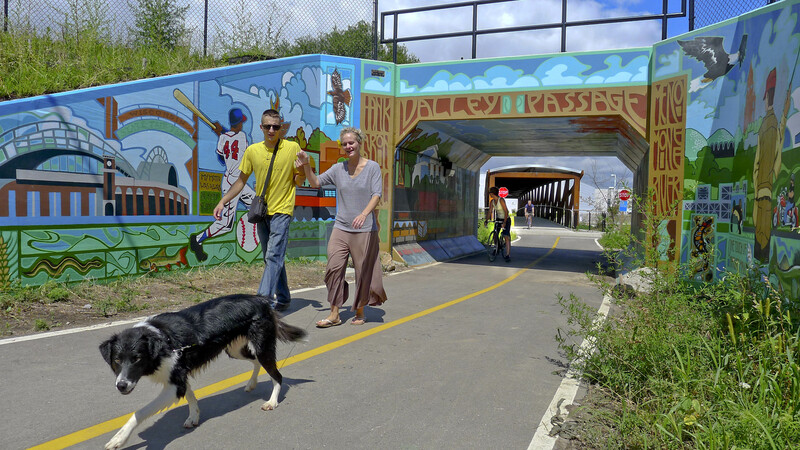 The underpass connects the segment of Oak Leaf Trail on Underwood Creek Parkway with the Oak Leaf off-street trail leading to Greenfield Park and the New Berlin Rec Trail. Before this underpass was constructed, it was very difficult to cross Bluemound, especially during peak hour traffic. My buddy Jason is a skater and can't help himself when he sees a ramp. Into the light, Jason gives the connection his stamp of approval. This used to be on Jason's daily route to work, and told me that he experienced a lot of near misses trying to get across Bluemound. The landscaping for the underpass was just finished earlier this week, and the "keep off the grass" caution tape is still up. I reviewed all these projects as a reminder that things are getting better all the time. While there remain many roads in Wisconsin that don’t have any bicycle accommodations, but we are slowly filling in the gaps between the existing bikeways. I don’t have a list of all the bike projects that have been constructed in all areas of the state over the last year, but I do know that Milwaukee is just one example of many cities, villages and towns that are actively working to become more bicycle friendly. Great post, Dave! With all of the negative news around cycling in our state recently, it’s good to get some positive perspective. My own commute has improved about 1000% over the least four years. It hasn’t really improved as a direct result of the Hank, the Marsupial Bridge, etc, the “big ticket” stuff. What’s really improved it is that I now have a wide and growing network of newly paved, smooth streets, many with bike lanes. 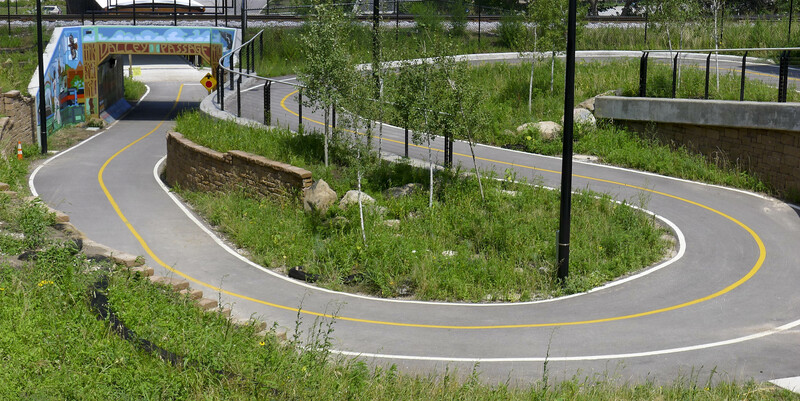 I really believe that the “little things,” like unbroken, intact streets, bike lanes and connections like the Bluemound Road underpass have a bigger impact on the average cyclist than the the “big ticket” stuff. The best city I’ve ever ridden in by far was San Francisco. What made it so great was not really the wonderful path along the Embarcadero and the bike path on the Golden Gate Bridge. Though that was amazing and a huge tourist draw. What it made it great was the fact that you could get to where-ever you wanted to go in a nice, hassle-free manner, despite the monster hills. 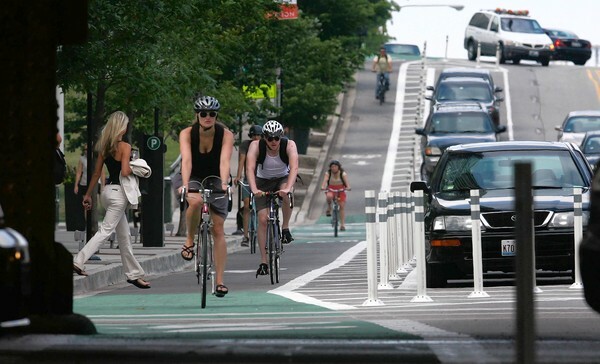 This leads to more bikes on the street, which leads to higher driver awareness, including the streets with no lanes. The drivers in SF seem to have gotten the message. 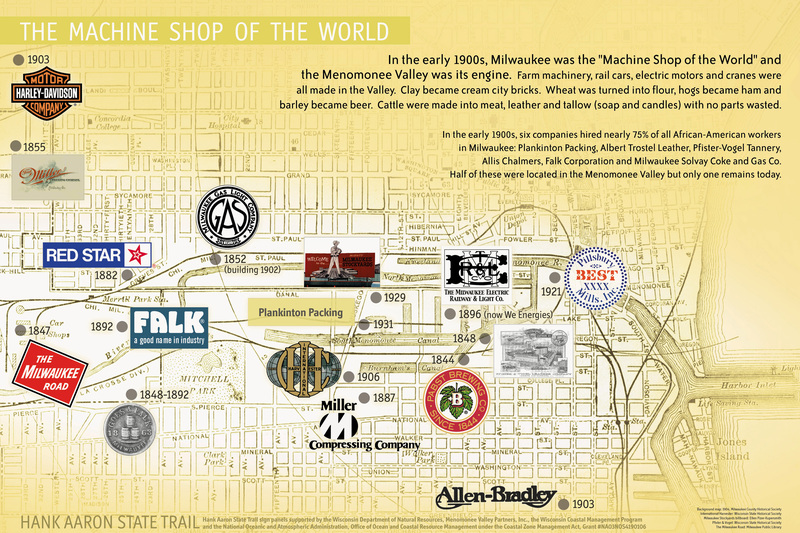 Thankfully, I see Milwaukee looking a little more like San Francisco (at least in terms of biking) as the years go on. Awesome post. I love reading about new safe places for bikers to ride. Especially after what I just encountered at Grant Park in South Milwaukee about an hour ago. I was driving with my kids in the minivan and witnessed a guy riding a bike who yelled at the top of his lunges, “CAREFUL!” to every single car that passed him on either side of the road. Honestly, he scared the heck out of me and my knees shook for a good 10 minutes afterwards. I did nothing wrong, in fact, as a biker I always go as far as I am able away from the biker on the other side of the road. I’m just dumbfounded, is this what some bikers feel the need to do? Yell at cars? Thanks for the comment Carol. That is a bit of a new one for me. I have seen plenty of irate people yell at cars that pass them too close or cut them off while cycling, but never heard of the “I yell at everyone” strategy. That is just as bad as saying all bicyclists are scofflaws. What I find sad though is that the guy is out riding his bike on an absolutely gorgeous day, but he sounds angry. Even if he has had some bad experiences, it is too bad he is letting them ruin his ride. Yep, that’s what I thought too. Thanks for commenting. Good luck with your new job. Not only is the Hank Aaron State Trail Extension a good commuter route, but it helps in going for an out-of-town getaway. Last month, I took it to the Oak Leaf Trail, then the New Berlin Recreational Trail, then the Glacial Drumlin Trail to Hwy. 67 . I took 67 to Cty. ZZ and Ottawa Lake Recreational Area where I camped. After passing through North Prairie the next day, I basically reversed the route to get home. Hi Dave – I just emailed this to my buddy Jim Coakley from Appleton. He is riding to MKE and looking for route advice to AMTRAK station. I suggested you as very knowledgable and told him to contact you. I will check my email Rob, otherwise feel free to give him my mobile number. 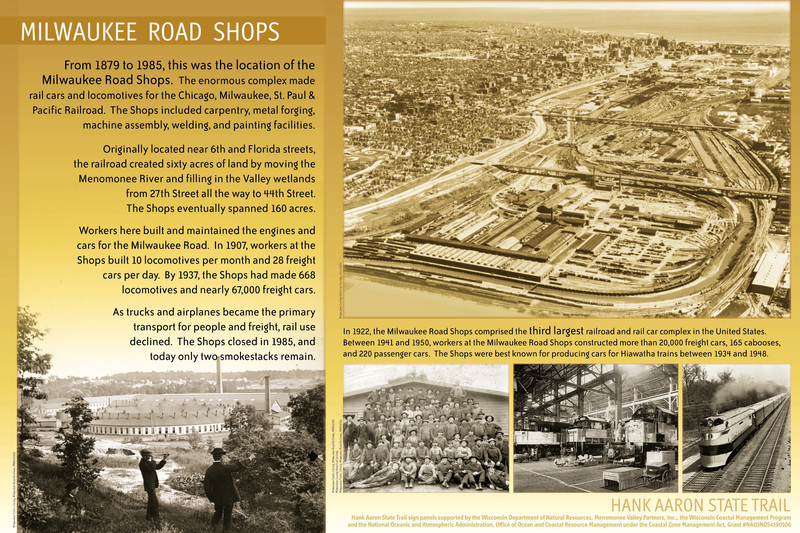 I was down at the Milwaukee Road Shops when the main building was being dimantled. Right there on the wall was a clue that the automobile didn’t always rule – a “Bike Parking Only” sign. That’s right – the prime parking spots up close. Alas, I did not have the tools to remove the sign from the wall with me. Those signs should be everywhere! area as it relates to biking infrastructure. a little more political will. position since Dave went to Bike Fed? Hey Chris, thanks for the thoughtful questions. I’ll answer what I can and then ask someone from the City for details on the rest tomorrow. 2. The senior staff at the City of Milwaukee Dept. of Public Works are as near to the bureaucratic equivalent of the mayoral champion as we have (except for Alderman Nik Kovac) in Milwaukee. 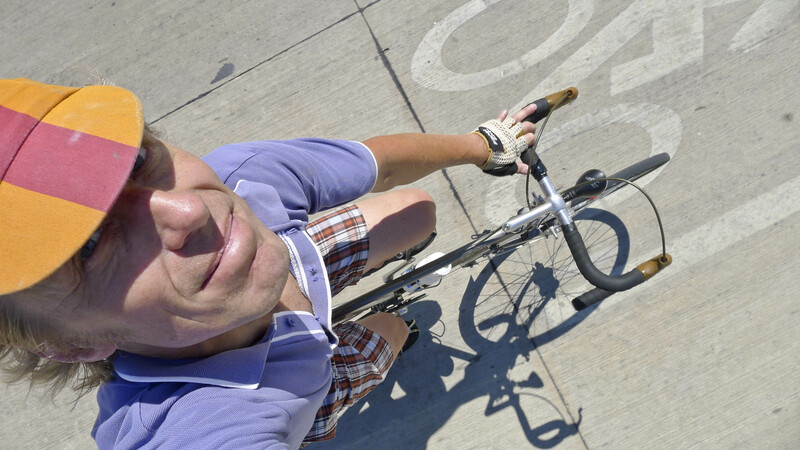 The City Engineer (jeff Polenske) bikes to work on a Milwaukee single speed with mustache bars for goodness sake. He also races in the RW24. You can’t get more ‘core than that. My immediate supervisor was the Chief Planning and Developments Engineer and he bikes to work. The former and current Commissioners were certainly bicycle allies. Second to the City Engineer is Clark Wantoch, the Admin & Transportation Design Mgr, and more times than I can count he went to bat and came out with funding for bicycle projects. I did review the job description to fill my former position, so I am pretty confident that it will happen. There was some discussion when I left about adding the duties of an ADA coordinator to the position. I bet that is what has yet to be determined. The US Justice Dept. is currently reviewing Milwaukee’s compliance with ADA rules, so I bet the City is waiting to see how that comes down. I will ask someone from the City to add more clarification to this answer, but since the raised bike lane is still under construction, as is another underpass at Capitol Drive, I wouldn’t worry about losing too much momentum. It would not surprise me if the bike mode share jumped quite a bit the next American Community Survey. Great photos. I rode the Hank Aaron trail to Ste Fair on the opening weekend. Really nice. While we returned it looked like someone was sketching in some more murals on the north side of the Valley Passage (the side not shown in the photo). Did you happen to see if those were completed? BTW the American Community Survey 2010 one year estimates will be released on September 22. Thanks Jeff, the HAST is the perfect route to State Fair, but I wish they would open a gate at the Tommy Thompson Center just before the bridge over 84th St. Then we could park there and enter/pay at that gate. It would be really easy for them to do and would not require additional staffing. Oh, and I am dying for the new ACS. I hope they have the mode share broken out for bikes with the first release. I got your name from Rob Guske. I’m planning to ride from Appleton to the Milwaukee train station. He thought you might have great suggestions for me to navigate from the south end of Lake Winnebago. Please email me back. I will get back to you later Jim, thanks! West on Michigan to 5th St.
Appleton Ave. (175) NW to YY past Lily Rd. 11 mi.